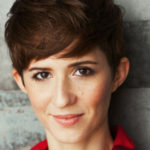 Sarah Elmaleh is a SAG-AFTRA actor and voiceover artist, best known for voicing player character Katie in Gone Home. She proudly serves in the Game Audio Network Guild Voice Actor’s Coalition, and occasionally curates, writes about and speaks on videogames and games performance. She is represented by Sutton, Barth & Vennari. Her game credits include Gone Home, Uncharted 4, Galak-Z, Call of Duty: Black Ops 3, Gravity Ghost, Skulls of the Shogun, Johann Sebastian Joust, Redshirt, and Codename Cygnus – she has been fan-dubbed “the Sean Bean of Wadjet Eye Games” for her frequent and often ill-fated appearances in the adventure game company’s titles. Other voiceover credits include an episode of sitcom Mike & Molly, a BBC Radio 4 Monday Afternoon Drama (“Drone Pilots”), audiobook “Cherry Money Baby”, and commercials for clients such as Johnson’s, McDonald’s, SodaStream, Amazon, Optimum, and Puma.